The past year has been full of learning experiences for Kasey Kahne Racing driver Brad Sweet. The 29-year-old Grass Valley, Calif. native took on his first full World of Outlaws Sprint Car Series season in 2014. In the process of figuring out how to be successful on the grueling Outlaws tour, he took home five wins and the Kevin Gobrecht Rookie of the Year award. Now, Sweet is diving into a new role — that of promoter. The opportunity to return the World of Outlaws Sprint Car Series to his home track, Placerville (Calif.) Speedway, after more than 20 years was just too good to pass up. 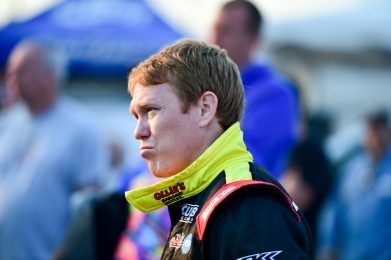 When the Outlaws return to the quarter-mile bull ring in the foothills of Northern California for Brad Sweet’s Placerville Short Track Outlaw Showdown on Wednesday, April 8, it will be the first time since 1992. In the four appearances the series made at the track between 1985 and 1992, Jac Haudenschild and Sammy Swindell each scored two wins. The support from fans and the community has been strong. Ticket sales have been brisk and Sweet has added regional NAPA Auto Parts distributer Riebes Auto Parts as a partner for the event. The Placerville Riebes Auto Parts store (2885 Ray Lawyer Drive) will host a luncheon open to the public from 11 a.m. to 1 p.m. on the day of the race, featuring an autograph session and giveaways with Sweet and other series drivers. Ruhs Bros Motorsport has also signed on as an event sponsor. While Sweet said his main focus remains winning with his Kasey Kahne Racing with Mike Curb team and not on expanding his promoter role, he is hopeful the event will be a success this year and can continue in seasons to come.